Find out what your dreams are trying to tell you! This app will help you make sense of your dreams and achieve a better understanding of them. 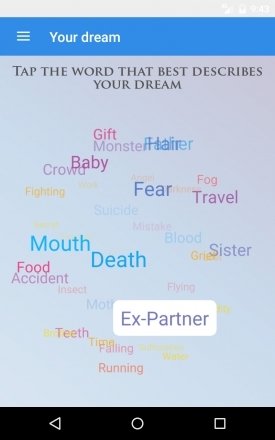 It works like a dream dictionary: select a word that describes your dream and get an insight into its hidden messages. 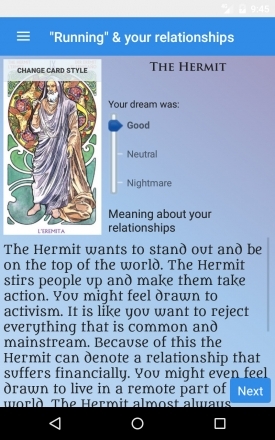 ★ How to interpret my dream? ★ What is the meaning of my dream? ★ How does my dreams influence my daily life? 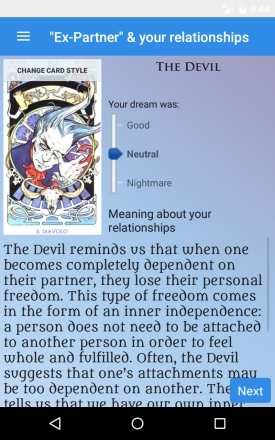 This app uses the capacity of the Tarot cards to interpret your dreams. Each of the Major Arcana gives a contextual explanation of a message contained in your vision. Given their agnostic nature, they can be used for islamic dream interpretation, christian or any other religion. We generally dream during 4 to 6 cycles per night. Some dreams contain vivid representations of reality while others can be surreal and elusive. Some can be positive while others are nightmares, but they all have special meanings and important messages hidden deep inside.